I have redesigned the bronze cloths. Hello, Where is the manga to buy? That's a great rendition of The Avengers in Shingo Akari's style. I first discovered his art style from certain episodes of 'Inspector Gadget', and 'Heathcliff'. I wish DIC kept him longer because I LOVE his art style. you should have someone write a story or write it yourself because it looks like it make a interesting story. I'm sure that Seiya might flirt with Black Widow. But, that's just a probability. ¿How is it going to work? Maybe only Hulk and Thor have business with them, once I read a fanfic where Tony fights Milo and Milo overpowers him, and later Hulk stomps Leo when I was sure Leo would win. your art is amazing and i'm loving the redesigns! I don't have words for this, believe me. I'm a horrible fan of both of this and this leaved me breathless. I loved how you did Ikki and Hyoga. I just imagine so many things with this orz ah! just beautiful! WOW! Thats' quite a crossover... o.O Veeery interesting concept. can you post just the bronze redesigned clothes? hahaha THE ART IT'S AMAZING!!!!!!!! I wanna buy your doujinshi! Two great tastes that taste AWESOME together. You're brilliant! This art is epic! So jealous! Wow! Beautifully done and I love the vibrant colours used here. Your redesigning of the Bronze Cloths are also perfect. 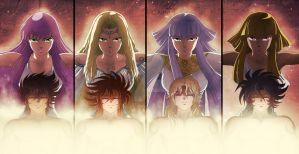 supercool fantastic crossover awesome saint seiya and avengers is one great work colugrations friend. i love it! that armours are amazing!! Man, I want to see more!!!! This is so perfect. It would be so awesome the saints meeting the nortic gods, since they fought the god warriors in the asgard saga. very nice, love the remake on the cloths!! !